What do dogs and sea turtles have in common? Usually nothing, but on the southern Pacific coast of Mexico, the stray dog population effects the survival of sea turtles in ways that most people have never considered. The local dogs feed on hatchlings, eggs and even occasionally nesting adults. These beaches are among the most important nesting sites in the world for many species of sea turtles, including the extremely endangered leatherback turtle. 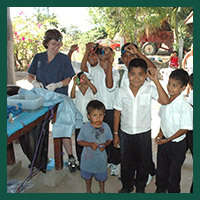 In the early years, one small team worked in a village every day for 5 days and less than 100 dogs were spayed or neutered. 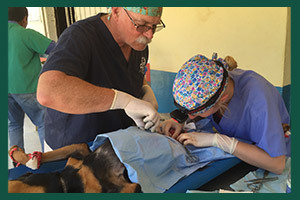 In the last few years, the project has grown to 3 or 4 teams, each with several veterinarians, working in different locations for 5 days and in January of 2018 close to 400 animals received surgery free of charge. There are fewer dogs on the beaches and in the villages and they are better cared for and healthier. 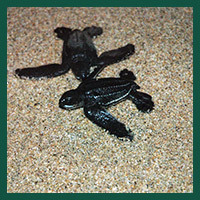 There have also been no incidents of dogs attacking adult turtles on the primary nesting beaches. The mission has clearly had a positive effect on the area. 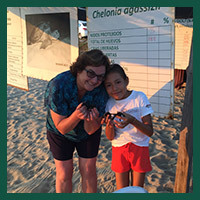 In 2000, Nancy Fantom and her husband Hugh Davis, DVM had the unique opportunity to become part of the first trip to the coast of Oaxaca to participate in a spay/neuter mission to help reduce the numbers of dogs in small villages near these nesting beaches. 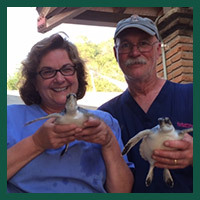 Along with Dr. Richard Rodger of Grafton, MA , the founder of the project, and several other veterinarians and volunteers, Nancy and Hugh traveled to Mazunte, Mexico and a passion for this mission, the area and its people, the welfare of the dogs, and protection of the sea turtles began and has continued for 15 years.